Race to the Top (RttT) is a massive federal program developed by the US Department of Education to administer the billions of dollars which will be granted to America's school districts. But there are strings attached. RttT is not just about giving out money – the Federal government is using RttT to motivate states and local school districts to make significant changes to some of their fundamental modes of operation, and not everyone likes it. For school districts which choose to participate in the RttT program, a Memorandum of Understanding (MOU) had to be submitted to the district's state Department of Education by January 11, 2010. The MOU must be signed by the Superintendent, the school board President, and the President of the teachers' union. According to the list posted on the ODOE website, our school district has indeed filed an MOU. Interestingly, not all of Ohio's school districts filed an MOU prior to the 2010 deadline. Colleen Grady of the State of Ohio Education blog has just posted a story reporting that the Youngstown City School District has decided to not participate in the RttT process because their teachers' union had a number of objections to the 'strings' attached to the program. The Fordham Institution's Flypaper blog had a similar announcement in regard to Dayton Public Schools. I'm not a big fan of letting the Federal government bully us around with our own tax money, and so I could find it easy to object to this RttT process on those philosophical grounds alone (Texans apparently feel this way as well). But then you look at our Five Year Forecast, and that whopping $65 million cash shortfall we are projected to accumulate by 2014, and you have say that we have to look seriously at any opportunity to put extra money in the coffers. I'm glad the Hilliard Education Association (HEA), the union representing our teachers and other certified members of the team, agreed to co-sign the MOU and not just reject it out of hand as did the teachers in Youngstown and Dayton. There will be a ton of dialog, compromise, innovation, and no doubt frustration required to fulfill the requirements of this process, but at least we get to have the conversations – and a shot at the money. This article continues the discussion about the perilous condition in which the State Teachers Retirement System (STRS) finds itself. Earlier articles can be found at Time Bomb, Still ticking, and Beginning to Understand. The January 3, 2010 edition of The Columbus Dispatch ran a batch of stories which the newspaper produced in cooperation with a group of the eight largest newspapers in Ohio. This is an astonishing feat of organization and cooperation, and should give readers a powerful indication of the seriousness of this matter. My hat is off to the publishers of these newspapers for undertaking this important piece of work. Here's the situation in a nutshell: The pension systems created to provide retirement income for most of Ohio's public employees are in big trouble. Without significant adjustments, some if not all of these pension funds may well go bust, potentially making it impossible to pay the benefits promised to the large number of people already retired, and those counting on that income when their turn comes to retire. These public employees do not participate in Social Security – this is all they have. But while it would indeed be a tragedy if this happens, the public employees themselves are among those responsible for this mess. Let me explain why I say this, focusing on the larger of the two retirement funds in which our school district is involved - STRS. Money is paid into a fund. Some of the money typically comes from the employees who will be the eventual beneficiaries of the retirement program, and some is usually contributed by the employer. As more money is contributed, the balance of the fund gets larger. To further increase the size of the fund, the money contributed is invested. It may be invested in CDs, US Treasury Bills, or in a Dairy Queen franchise at the North Pole. Each pension system makes its own policies and decisions as to how much risk to take with their money. In the case of STRS, these decisions are made by the Retirement Board, which has eleven members – seven of whom are elected from the ranks of active and retired teachers. This is why I say the STRS members are complicit in this situation – their representatives comprise the majority of the Retirement Board, which determines investment policy. Money is paid out of the fund to retirees. The fund will have its own rules as to minimum age, service requirements, and benefits to be paid. As money is paid out, the balance of the fund gets smaller. By law, STRS offers its members three choices in retirement plans: a) defined benefit; b) defined contribution; and, c) a hybrid of the two; but nearly all members choose the defined benefit option. This means that regardless of the amount of money that is paid into the system by its members and their employers, or how much return in generated on the fund balance, the benefits to be paid to a retiree are set when the retiree enters the system, and changing the benefit structure afterward is very difficult. In private industry, it is the employer who takes the risk in regard to funding shortfalls in a defined benefit system. In the public sector, it is the taxpayer. But in neither case is it the employee – generally speaking. Conversely, with a defined contribution plan, the benefit paid is based on the amount the worker and employer paid into the fund, and how well the investments made by the fund managers performed. But however it turns out, the retirees are paid according to the actual earnings of the fund – whatever that turns out to be. If there have been big investment returns, the retirees get big pension payouts. With meager investment returns, the pension payouts are meager as well. Consequently, a defined contribution plan can never be underfunded. So when an employee chooses a defined benefit plan, they're taking a bet that their retirement benefits will be better than if they were in a defined contribution system, or had just invested the money themselves. An employee who selects a defined benefit plan is essentially betting that future economic conditions will not be very rosy, and therefore they would prefer the sure thing of a defined benefit plan over having a shot at getting a really big payoff in a defined contribution system. Why? Because they don't see the potential upside of a defined contribution plan as being a good bet against the chance of working thirty years and having nothing to retire on. In other words, choosing a defined benefit plan is a risk-adverse strategy for the plan member. However, a defined benefit plan is far from risk free for the employer – in this case the taxpayers of the school district. The employer guarantees the output regardless of the inputs, therefore it's the employer who takes the big risk. As taxpayers, we don't get a choice whether or not to assume this risk for the STRS defined benefit plan – it is written into the Ohio Revised Code that public school teachers will be offered a defined benefit retirement plan, and nearly all take advantage of it. There is a branch of management called actuarial science which specializes in performing the financial and statistical analysis necessary to project how such bets are likely to work out. In the life insurance industry, it is the job of the actuaries to figure out how much has to be paid in premiums for a set of policies, how much the insurance company can expect to earn by investing that money, and how much – and when – money will be need to be paid out in benefits. Their analysis is crucial in setting premium rates and determining policy features, such as the death benefit and cash value. When they get it wrong, an insurance company loses money. The STRS has actuarial advisors as well. The actuaries estimate how much money will be paid into STRS over time, what the investment return will be, and how much will be expected to be paid out over time – all for the purpose of ascertaining the fiscal viability of the plan. The elements of this estimate include projections of the life expectancy of retirees (e.g. the "actuarial tables"), as well as a set of key assumptions, such as the specific rules of the retirement plan. The rules include, for example, what percentage of salary is contributed to the fund by the employee and employer, at what age and with how much service an employee can retire, and the formula that determines what the retiree will receive in compensation. But other assumptions are just guesses. Hopefully well thought out guesses, but still just guesses. Key among those is the presumed investment rate of return on the retirement fund. Right now, the STRS Board has told the actuaries to assume that the investment return will be 8% per year – a formidable goal in today's investment environment. If the STRS system is a time bomb waiting to go off, then this aggressive assumption of investment returns is the fuse. One of the basic rules of economics is that risk and reward are (supposed to be) directly connected: the only reason you would take greater risk on an investment would be to have a chance of getting a greater reward. After all, if you could get a 5% return on your money by putting it in an FDIC-insured savings account, why would you ever buy a General Motors corporate bond that also pays 5%? While there is virtually zero risk of losing the money you put in the savings account, there is certainly risk that GM could go bankrupt and be unable to return the money you have invested in their bond. In fact, GM did exactly that last year. Generally speaking, if you want to take the minimum risk with your money, you put it into Treasury Bills, but you also accept getting paid very low interest rates. Next you might consider Certificates of Deposit at an FDIC-insured bank, which is substantially the same as being insured by the full faith of the US Government. An FDIC-insured bank will pay a slightly higher interest rate than the US Treasury, but generally not much. If you want to make a significantly higher return than T-Bills or CDs, you have to take more risk. For most of the last twenty years, the choice for those seeking higher returns has been to risk it in the stock market, mostly via professionally managed mutual funds, and mostly with retirement money placed in IRA and 401(k) accounts. But it isn't just individual investors who were pouring money into the stock market – the pension funds got into the stock market in a big way as well. You could even observe that the pension funds became the most important buyers and sellers of stocks, precisely because they had so much money to throw around, all controlled by a small number of investment managers. I bet it's a lot of fun to play around with tens of billions of dollars of someone else's money, as is the situation for the STRS investment managers. Returns in the stock market remained so high for so long that a bizarre thing happened – people began to perceive stock investing as risk free. It seemed like everyone was making money in the stock market, and there for a while, pretty much everyone was. So it looked pretty stupid for pension funds to limit their investments to US Treasury and high quality corporate bonds when there was lots of money be made in the stock market, at little perceived risk. Eventually – despite showing their risk-adverse nature through their overwhelming choice of the defined-benefit retirement plan – the leadership of STRS gave into this temptation, and invested substantial portions of the STRS fund in stocks and the other darling of the last decade – commercial real estate. In its 2008 Investment Plan, the STRS leadership said it would allocate 65% of its money to stocks (40% domestic and 25% foreign), 19% to government and commercial bonds, 8% to real estate, and 3% to 'alternative investments.' In this plan, the STRS leadership said they expected to achieve a 7.42% return on their investment, growing the fund from $75 billion to $78.5 billion. The numbers geeks out there will observe that a 7.42% return on $75 billion should cause the fund to grow to $80.6 billion. But remember that benefits are also being paid out to retirees. New money comes in as a result of working members and their employers making contributions. The pot is sweetened by the returns on the money as it is invested. Then money is taken out of the fund to pay benefits to retirees. The trick is making sure that the fund always has enough money to pay its future commitments. 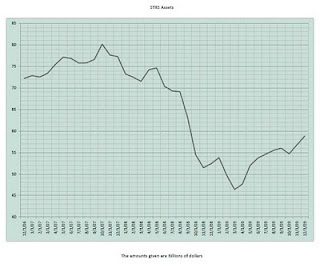 Fiscal year 2008 didn't go exactly as planned for the STRS. Instead of growing the fund balance to $78.5 billion, it actually fell to $70.8 billion. Of that $7.7 billion loss, $4.2 billion were investment losses. Where did the rest of the money go? There is a very significant statement at the bottom of page 10 of this report: "Pension benefit payments and health care costs exceed member and employer contributions. Investment income generally compensates for the difference between benefit payments and contributions." In other words, the level of benefits paid out by the system cannot be sustained by the contributions made by the working members and their respective school districts – the viability of the system depends on making an aggressive return on their investment portfolio. It didn't work out that way in FY08, when the investment losses and net outflow of benefits combined to amplify the loss. FY09 appears to have been worse. While I have no official source to confirm these numbers, according to numbers published by retired STRS member and activist Kathie Bracy, at its lowest point in March 2009, the value of the retirement fund had dropped to $46.5 billion. Her numbers show the FY09 year end balance to have bounced back to $54.5 billion, and continuing to grow to $59 billion by the December 2009. The reason for the dramatic drop in value and (partial) recovery is simple – nearly two-thirds of the pension fund is invested in the stock market. When the stock market went down, the pension fund went down with it. As the stock market has regained some of its losses, the fund has risen with it. 'The rising tide floats all boats,' as they say. I suspect that their real estate portfolio is still in the dump however. So has the STRS Board and management learned a lesson about risk and return? It doesn't seem so. Their FY10 Investment Plan indicates that they intend to seek total return of 7.7%, and will do so by achieving in excess of 8.5% return on their stocks and 4.8% on their government and corporate bonds. They will keep 65% of the fund in stocks and 18% in bonds – pretty much the same allocations as the past several years. In other words, they're doing little to change their risk profile. If the stock market takes another tumble, they'll get whacked again. I can understand why they are doing this. There is another statement in the FY10 plan which must terrify the STRS Retirement Board: "With a projected total fund return of about -25% for fiscal 2009, the amortization period for the unfunded liability is likely to increase to an undetermined amount for July 1, 2009, from 41.2 years on July 1, 2008." That's gobblety-gook to most of us, but what it means is that based on the key elements and assumptions, the fund is in serious trouble – so serious that the Ohio Revised Code calls for special action, namely that the pension Board must file a report within 90 days indicating what they're going to do about it. They need to figure out how to put more money in, take less money out, and/or earn more on their investments. This aggressive investment strategy is meant to address the least painful of those three choices. It's a high-risk bet. STRS Executive Director Michael Nehf recently issued a public statement on the issue (which can be read here), knowing that these stories would soon appear in the newspapers across Ohio. He mentions a key distinction between STRS and private pension plans – STRS is created and governed by Ohio law, which describes most of the rules under which its members and their employers must operate in regard to STRS. Those laws don't come out of thin air. They are the result of the political process, including heavy lobbying by the STRS and the Ohio Education Association, the union which represents nearly all Ohio teachers. That political process has been engaged, with the first draft of a new piece of legislation having already been drafted, per Mr. Nehf's announcement. A cornerstone of this legislation is expected to be an 18% increase in the amount of the employer (taxpayer) contribution, from 14% of each teacher's salary to 16.5%. The teacher's contribution will also increase from 10% to 12.5% - with both increases phased over several years. There will almost certainly also be reductions in retirement benefits as well, although it appears that those changes will be applied to teachers yet to retire, protecting those teachers already retired. By the way, under the current retirement plan, a Hilliard teacher who retires in 2010 with 30 years of service and a Master's degree will receive a lifetime annual pension of $54,976. A teacher with 35 years of service and a Masters degree plus 15 additional hours of study would receive a lifetime pension of $76,787. The public will have no vote in this matter of increased employer contributions. The politicians in the Statehouse will work out their deals, a new law will be passed, and one day the people of Ohio will have the cost of running their school districts jacked up by another painful increment. As an unorganized set of individuals, we will again lose out to the highly organized and well funded special interest groups, led by the STRS and the OEA in this case. I am reacting strongly to this not because I think the teachers don't deserve a decent pension. The pension was part of the deal when they hired on, and the deal they have continued to serve under, and we need to honor that commitment. But we have already funded these pension liabilities once.It was the decision of the STRS Board to invest most of their money in risky investments which have tanked – not mine. They took our money in the form of taxes and were expected to be good stewards of our money as well as the teachers', investing it in a way that protected and grew the fund so that reasonable benefits could be paid to those teachers later when they retired. Instead they got greedy – both the STRS leadership and the teachers who are its members – and put the money into risky investments such as the stock market. There has never been a time when the stock market was risk free, although some have always believed they could mitigate the risk. Those techniques don't usually work in a general crash. A rising tide may lift all boats, but in the same way a falling tide can leave all boats high and dry. We understand completely what happened – many of us made the same choices with our own retirement savings. The difference is that when we, as employees in the private sector, take a hit in our IRA or 401(k), there is no one we can force to kick in more money to recoup our losses. In fact, many companies which had been contributing some level of matching funds to their workers' 401(k) accounts have significantly cut their matching programs, if not discontinued them altogether. Millions of American workers who thought they were headed for a comfortable retirement in their young 60s are now faced with working indefinitely to preserve a reasonable standard of living. That's our version of an unfunded liability, and the Ohio Revised Code doesn't contain one word of help. But the STRS, on the behalf of the active and retired teachers, can influence our lawmakers into transferring the cost of their risk-taking to the taxpayers. And that's exactly what they intend to do. If this situation with the STRS is all okay with you, then relax – you can just sit back and let things happen. But if you see things the way I do, you need to take action. Write Governor Strickland, State Senator Jim Hughes and State Representative Cheryl Grossman and tell them that if the people of Ohio are expected to bail these pension funds out when the rest of us suffer, some significant things have to change. There has to be limits on the amount of risk these guys are allowed to take going forward, and adjustments made to the retirement benefits commensurate with a more conservative and sustainable rate of return on the investments.